The simple act of eating together nourishes emotional health and in turn has a tremendous impact on how the body absorbs nutrients. 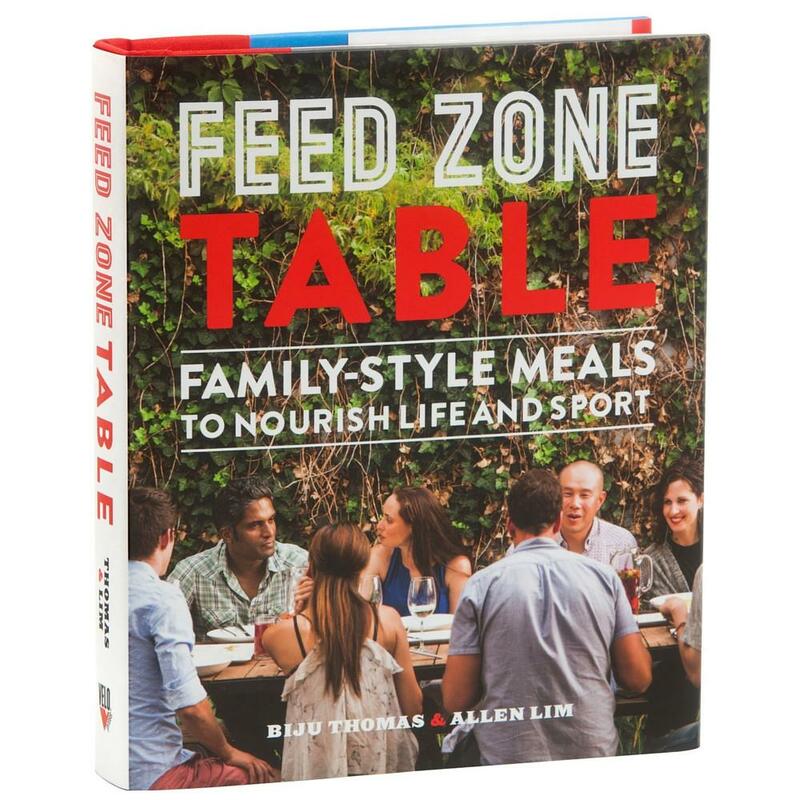 Last year, my one selfie Christmas present was a new recipe book: Feed Zone Table, Family Style Meals to Nourish Life and Sport. Co-authors Dr. Allen Lim and chef Biju Thomas have paired up to feed top American athletes and teams on the pro cycling tour. I picked my copy up at SpinZone Cycling, Granger, IN, enticed by co-owner Sheri Colan’s recommendation. It’s been a tasty purchase! The premise: While athletes calibrate training and diet for better performance, it’s a pursuit that often isolates them from friends and family, especially when it comes to the most social meal of the day—dinner. According to Dr. Lim, the simple act of eating together nourishes emotional health and in turn has a tremendous impact on how the body absorbs nutrients. Pair this salmon with Warm German Potato Salad or Kabocha Squash Mash from recipes in Feed Zone Table. “Or keep it easy and serve with grilled bread or rice and a simple salad,” suggest the authors. Also, if you don’t have time to make homemade barbecue sauce (but try to make time,) add fresh ginger to a store-bought variety. Plan for about 4-5 ounces per person if you are serving this as a main dish. Serves 6. To make the barbecue sauce, stir the fresh ginger and black pepper into the Homemade BBQ sauce. Set aside. Heat the grill to high. Brush fish with olive iol and season with salt and pepper. 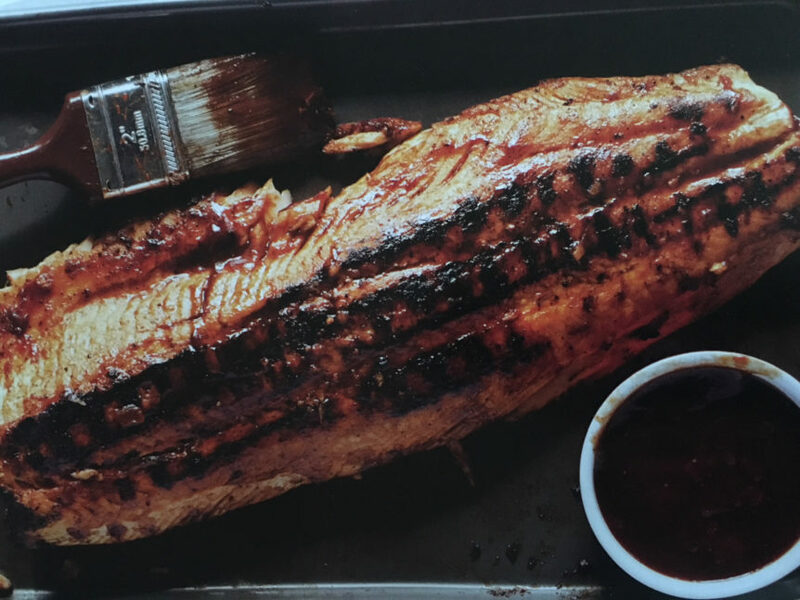 Gently lay the salmon skin-side down on the hot grill. Cook about 4-5 minutes, or until the edges begin to char. Carefully flip over the filet with a metal spatula. Brush with the barbeque sauce and cook about 3-4 minutes, or until the edges begin to char again. Cut a little slit in the thicest part of the fish to make sure it’s cooked to your liking. Salmon is typically prepared medium rare, or to an internal temperature of 145 degrees. Note: T prepare the salmon on the stovetop, use a sharp knife to cuyt the filet into 6 equal protions. Keep the skin on, as it adds flavor during cooking. Cook the salmon sarting skin-side down over high heat in a heavy skillet. Republished from Feed Zone Table with permission of VeloPress. See more at velopress.com/feedzone or purchase the book at SpinZone Cycling. american athletes and teams on the pro cycling tour. Biju Thomas is a professional chef with a passion for feeding people good food. Biju has cooked for some of cycling’s top athletes and teams.